So where is that enormous vice-regal gold vase? 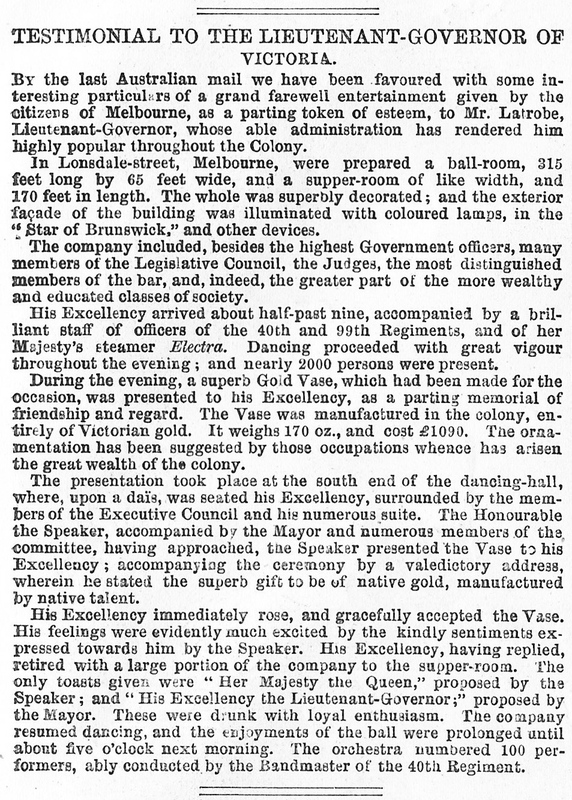 2013 is the 160th anniversary of the presentation of a ‘gold testimonial’ vase to Victoria’s first Lieutenant Governor in 1853. And while there is the La Trobe Reading Room, La Trobe Street, the University and La Trobe City, no-one seems to know what happened to this unique and valuable piece of our Colonial and State history. Many Victorians are aware of the La Trobe testimonial candelabrum centrepiece that is on display at the National Gallery of Victoria. This spectacular silver and glass piece was manufactured in London by Stephen Smith & William Nicholson (1854-1855). This silver ‘testimonial’ was presented to Lt Governor Charles La Trobe following his return to London in 1854. The silver candelabrum is in fact the second of two significant testimonial works presented to La Trobe. 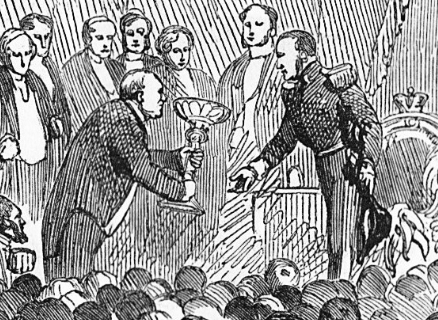 The first testimonial, an enormous gold cup, was presented at a ‘grand ball’ in Melbourne on the stormy evening of Wednesday, 28th of December, 1853. Controversy surrounded the gold cup even then, with the Argus reporting that while only a small objection was taken to the ball, some “indignation” was felt about the golden cup being presented and that it was no less than an “outrage” that such a man should receive the cup. Despite the local debate about La Trobe’s competency and how unpopular some felt he was, the Illustrated London News reported details of the grand farewell from the last Australian mail, six months later in June, 1854. “Highly popular throughout the Colony,” with nearly 2000 people attending, the gold cup was presented at the grand farewell in Melbourne. 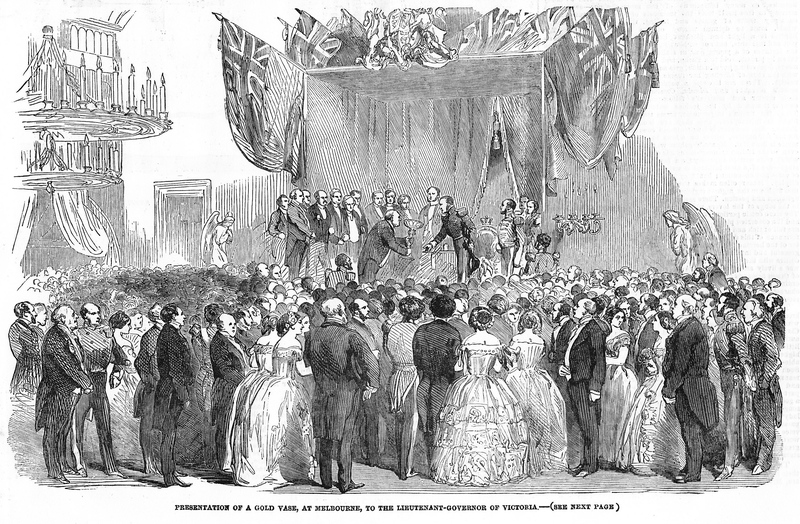 Close examination of The Illustrated London News illustration shown not just a glamorous Colonial Ball, but perhaps more importantly, what could be the only remaining visual representation from the period of the gold cup. With the discovery of gold only a few years earlier in 1851, goldsmiths in the Colony were still in their professional infancy by 1853. Important works of the time would often have Victorian gold shipped back to Britain for use by reputable London goldsmiths. La Trobe’s golden testimonial was reported as being 170 ounces of native Victorian gold and, importantly, manufactured by native talent, Victorian goldsmiths Bond and Tofield under the supervision of the retailer, Mr Drew. For these reasons alone, the gold cup is significant for Victorian State history. The cup was 16 inches in height, with the inscription on the front and the arms of the Colony of the back. It was decorated with solid figures of a digger (representing La Trobe’s friend Captain Brown) and a ‘native’ throwing a spear as well as an emu, kangaroo, sheep and gold nuggets. While controversy surrounding the gold cup in 1853, in the 160th anniversary of its manufacture (which reputably took only two weeks), very little else is know about this golden piece of Victorian Colonial history. Mystery now remains about the fate of the cup, as it seems to have vanished without trace. While hypothesis abound on its fate – was melted down or does it remains in the dusty vaults of a European museum or an American private collection or was it shipped to a great exhibition and sold – it is hoped that renewed interest in La Trobe and Victoria’s golden past will uncover more information on the ultimate resting place of this unique piece of Victorian history. If you have any information on the whereabouts or fate of the ‘gold’ testimonial, please contact the Andrew McIntosh from museumandhistory.com at andrew@optimizesbiz.com or via the comment section below. Adapted from ‘La Trobe’s Golden Testimonial’, first published in the La Trobeana (journal of The C J La Trobe Society, Inc. Australia), Vol 10, No 3, November 2011, 48-49.